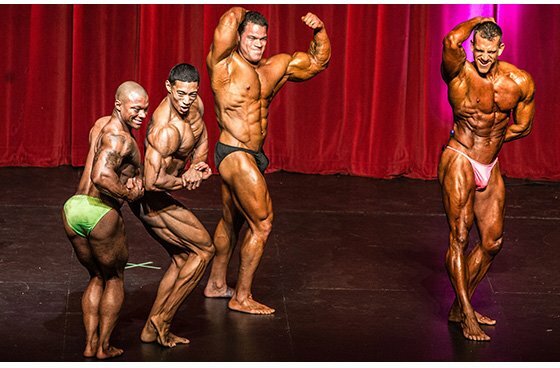 Bodybuilding is in the eye of the beholder. There's no definitive way to sculpt a pristine physique. Justin refuses to live by the rules. He creates his own guidelines, and they work! I graduated high school at an impressive 135 pounds. I was lean, detailed, and voted best body by my graduating class. I thought I was huge. My self-perception was way off. I was a bodybuilding fan early in my life, but couldn&apos;t get started until my other sport-related exploits were finished. I ran track in high school and accepted a scholarship to Iowa State University for four years in the Big 12 Conference. Developing bulging rear delts and striated triceps didn&apos;t help me sprint faster. Our routines were low-rep, explosive, dynamic movements like power cleans, snatches, and box squats. By the time I graduated from ISU, the highest number I ever hit on a scale was 165 pounds. My race weight was around 155 pounds. When my tenure finished, I graduated, and moved on. I started pursuing a bodybuilding lifestyle as a new chapter to challenge my body and mind. I use a workout regimen as a simple guideline because I&apos;m instinctive in my training. I always listen to my body and I don&apos;t train with a spot-on regimen. I know my body and I listen to it and believe that is one of the keys to avoiding injuries. I make sure to drink 1-1 1/2 gallons of water daily. I usually stick with a BCAA formula because it makes drinking a gallon and a half of water per day much easier. I also keep the oils (fish and flaxseed) in my regimen, but I cycle using pre-workouts on and off every eight weeks or so. Bodybuilding for me is, and always will be, an art and a passion. I was a design major in college and can appreciate the perspective taken by guys like Shawn Ray on how bodybuilding should be based on things like symmetry, definition, proportion, and presentation. When you take that approach to bodybuilding and focus on the shape and balance of the body and the development of the muscle, it&apos;s like sculpting a living, breathing masterpiece. I have a vision of what my masterpiece is and I&apos;m passionate about my work toward my sculpture. This may sound funny, but Marvel Comics and Dragonball Z characters are what motivated me. The reason I wandered to the magazine section at the grocery store and looked at bodybuilding magazines as a kid was because I wanted to look like my action figures. I wanted to have their muscles, the size, and the detail. I found out it was an actual sport and wanted to be a bodybuilder ever since. I go to YouTube and BodySpace and watch videos of guys who possess my ideal physique like Stan McQuay and Shawn Ray. I look at my BodySpace to see photos of where I was the last time I dieted, which motivates me to push forward so I can progress and be better next time. I just competed in my first show November 3 at the 2012 NPC Midwest Ironman at the Gateway Theater in Chicago, Illinois. It was a great experience and I&apos;m happy to have finally done a show. I would like to compete in that show again next year in the light heavyweight division. With a baby girl and a wedding on the way, I&apos;ll have to wait and see what I can realistically accommodate in my schedule as far as show prep goes. If you&apos;re a rookie like me, find a prep coach—someone local who is seasoned in the sport and has lived the trial-and-error days. I know a few guys who just read articles and make educated guesses only to have the end result be less than desirable. The suffering endured during prep isn&apos;t worth a poor contest showing. If you&apos;re going to suffer through the cardio and diet, it should be worth it. My favorite bodybuilder is Shawn Ray. I respect the fact that he built his physique based on what he believed bodybuilding to be. He never sacrificed his shape, balance, or symmetry to play the size game and stack up with the likes of Dorian Yates and Nasser El Sonbaty. I even incorporated some of his poses from the 1999 Mr. Olympia contest into my routine. I&apos;ve been using Bodybuilding.com as a resource for supplement reviews and training advice for many years. I joined BodySpace in 2008, so I&apos;ve been frequenting the site for at least five years. After checking the forums daily and many supplement orders later, I&apos;m coming closer to my goal physique every day. I can attribute many of my successes and my newfound training and supplementation knowledge to Bodybuilding.com.